Due to Independence Day, which makes us decide to eat at home (BBQ sausage on the grill! ), this week’s Date Night falls on a Saturday. And what a better way to celebrate America than with…French food! Evidently the French did help us out during the Revolutionary War, so in honor of that assistance, we head to Decatur to check out Alsace. Cafe Alsace is the favorite restaurant of work pals/Date Night readers John and Sally, who join us here tonight on a double date. They are regulars who know the owner, Benedicte Cooper, who just happens to be from the Alsace region of France. As we shall soon see, this area of the country has German influences in its food. The cafe has been here since 1997, a very long time by Atlanta restaurant standards. Alsace is overshadowed by its bigger neighbors 246 (Date Night, 3/30/12) and Leon’s Full Service (Date Night, 12/27/13), which are two doors down. It’s a small dining room with room for perhaps 40-50 people when full. There aren’t a lot of places where you can get 1664 Kronenbourg (French) beer on the menu. This is one of them. The wine will come later. Rebels that we are, we go Belgian since Belgium had lost its World Cup match earlier in the day. Chimay Gold is always a good choice. It’s the perfect Belgian triple and Alsace gets extra points for serving it in the proper glass. 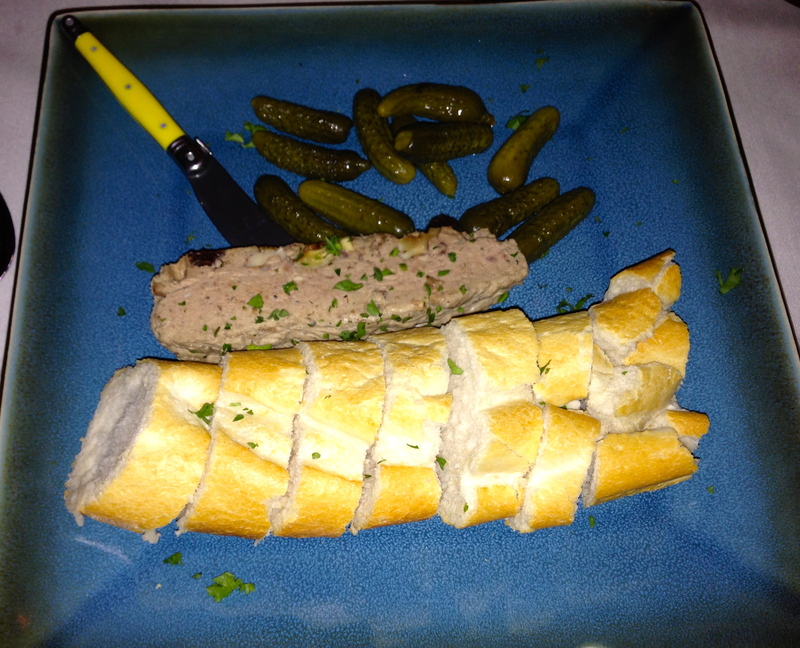 We start off with perhaps the best pate this reporter has had, in France or in the USA. I ask what the secret ingredient is, but Chef Cooper is not telling. We decide it’s “love”. I used to avoid pate, now I can’t get enough of it. Make sure you get this if you enjoy the stuff. 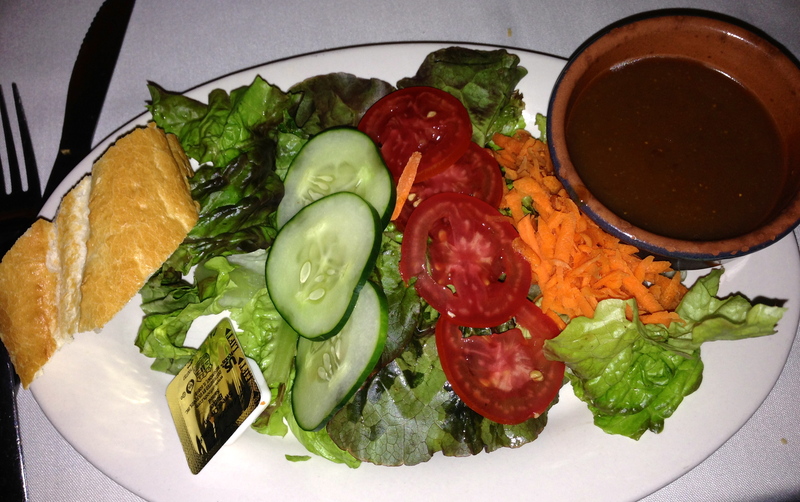 The entrees start off with a very fresh salad. The fig and honey dressing is not too sweet and is a great way to top the healthy portion of this meal. The German influence is evident on the menu. There are a few varieties of spaetzle, German noodles. Eve selects the spaetzle du jour, which comes with pesto, shrimp and salmon. The cream and cheese sauce is amazing, hot and bubbly. Just don’t think of the calories as you eat it. The big chunks of shrimp and salmon combine to make a dish that is not easily forgotten. 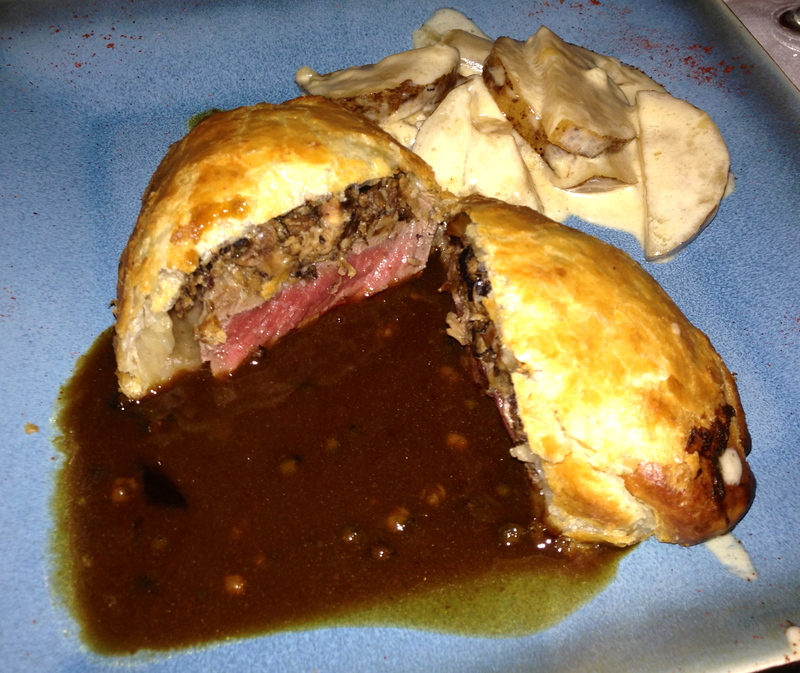 John and I both order the Boeuf Wellington, which I have not seen on a menu in ages. The beef tenderloin is so soft that I can cut it with my fork. The pastry shell covers mushrooms and green peppercorns, which give the beef a very nice kick. At only $24, they are not charging enough for this plate. Sally orders her favorite, the poulet farci. 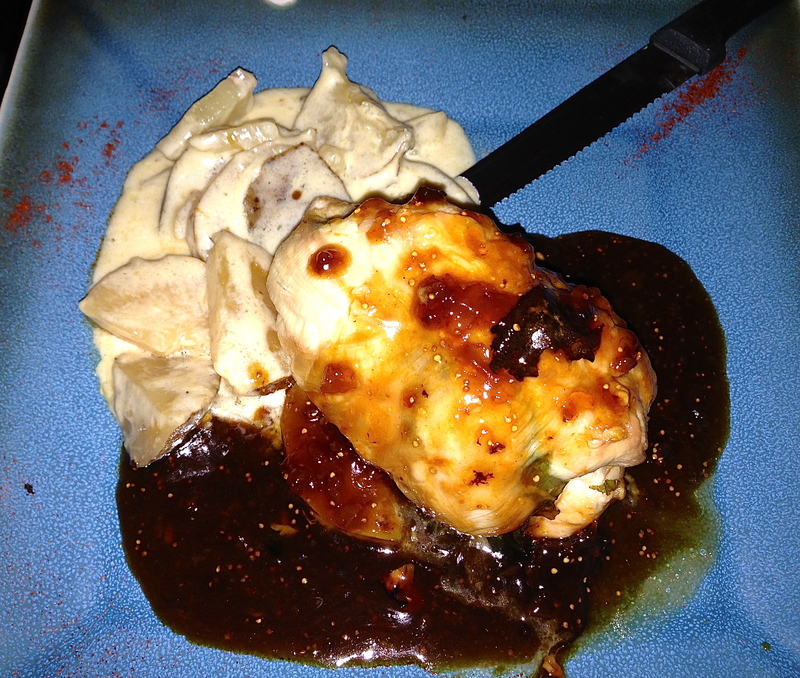 A chicken breast is stuffed with pecans, brie and spinach and covered with a fig sauce. 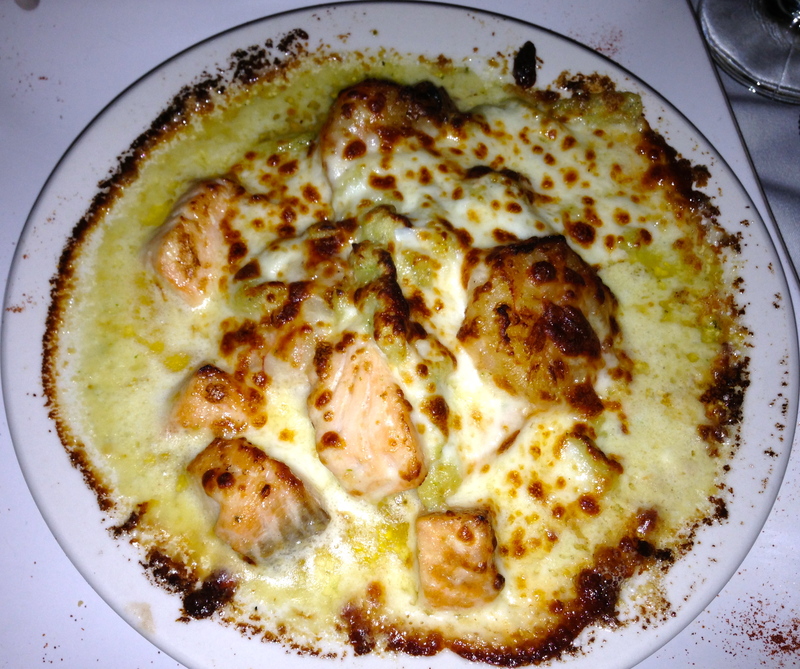 Check out the cheesy potato gratin which comes as a side dish with many of the entrees. We have a lovely bottle of French wine with dinner, but forget to take its picture. Our apologies. You will have to take our word that it went splendidly with this cuisine. They make the desserts right here and we cannot resist. In fact, we can’t decide, and order two. 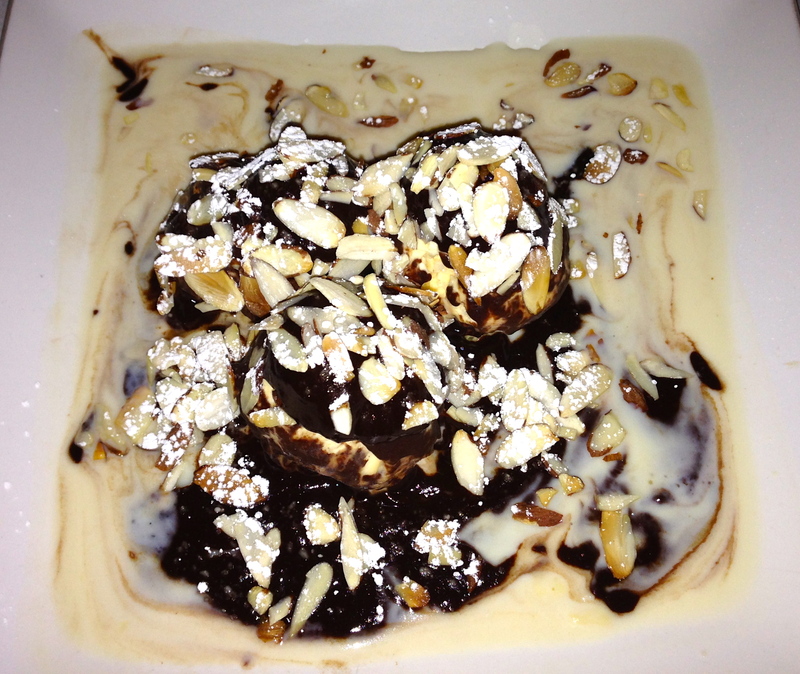 Profiterolles come stuffed with vanilla ice cream and covered in a chocolate sauce. They are sitting on vanilla cream sauce. It’s decadent and we enjoy every bite. Not as decadent (or is it?) 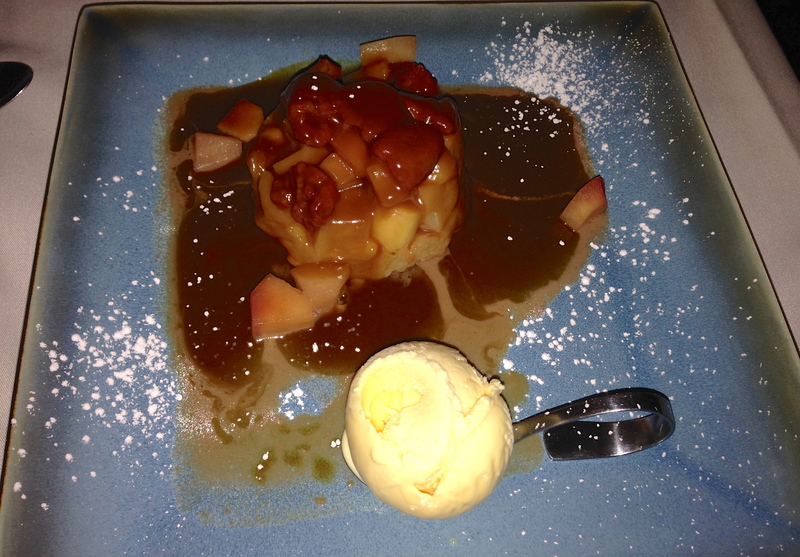 is the tart tatin du jour. Today’s is apple, pear and raspberry. Top it with a caramel sauce and we are all in heaven. This is not a painting by a new-wave French artist. 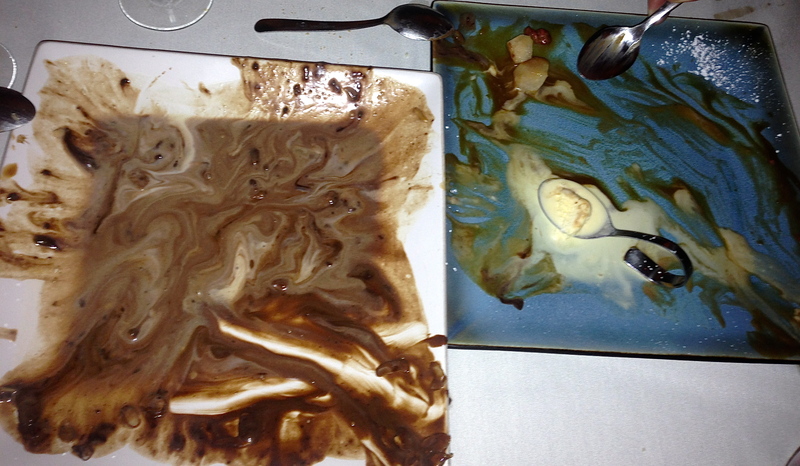 It’s our dessert plates after we are done. We would have licked them, but that’s not very continental. 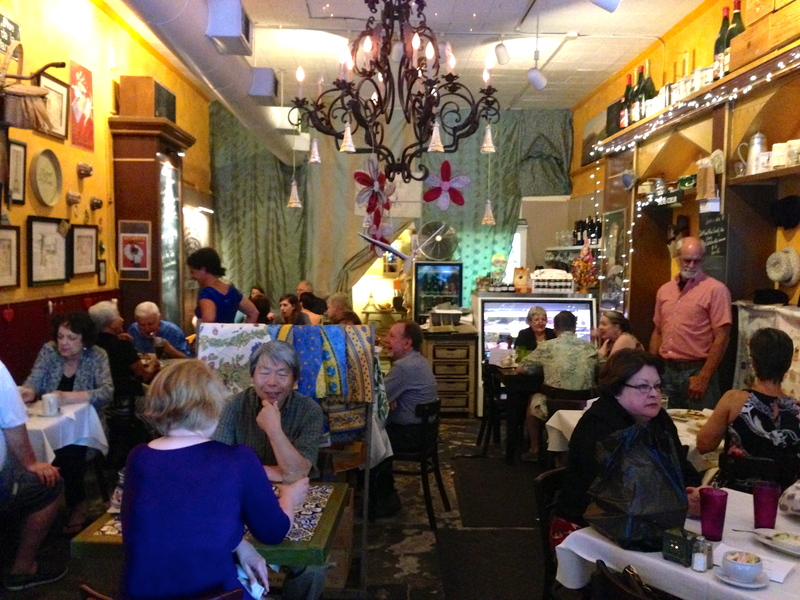 The bottom line on Cafe Alsace: Tres bon! We thoroughly enjoyed everything that was put in front of us tonight. This is food that is hard to prepare and takes a talented chef. Alsace does not get a lot of foodie buzz, and Date Night feels like we have uncovered a hidden gem in Decatur. 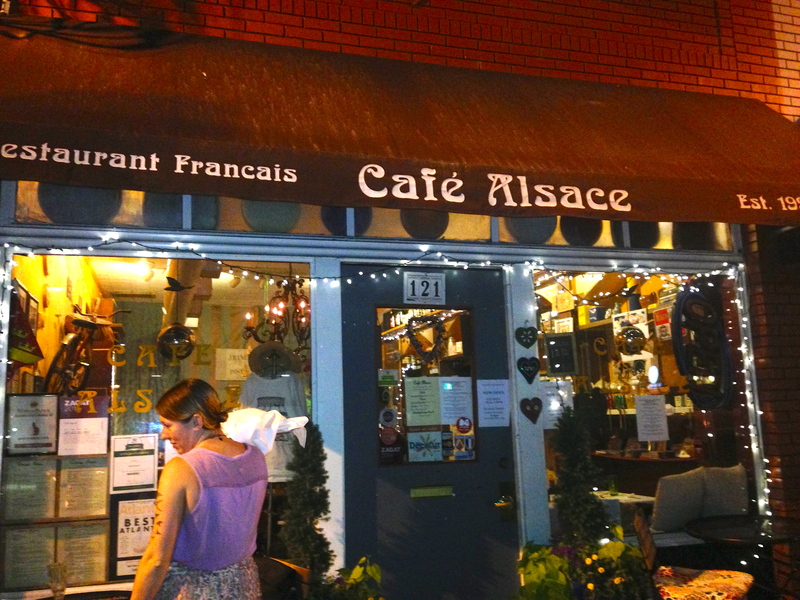 If you are a French food fan, you must go experience the “joie de vivre” that Alsace provides to the Atlanta food scene. Haven’t been there in quite some time – must go again soon! 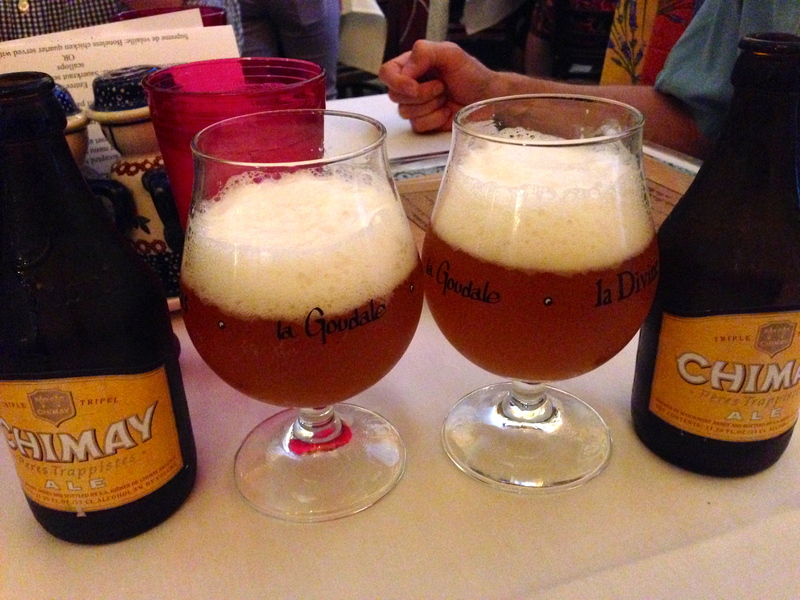 Also, discovered Chimay while in Belgium recently – it is one of my very fave beers. Hard to find in ATL. Love this place, always good!! !